London Cast, 1976 (EMI/no CD) (4 / 5) This bouncy, well-performed London Irene stars the excellent Australian performer Julie Anthony. The arrangements and orchestrations are almost identical to those of the Broadway revisal, and they sound bright and crisp as recorded here. Under conductor Ralph Burns’ excellent baton, the chorus numbers are particularly spirited and exciting. 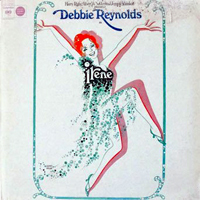 As Irene, Anthony shows off a thrilling voice with much gusto, and she can belt out a show-stopper and then turn around and deliver a soft, tender ballad very effectively. The strong supporting cast includes Jon Pertwee, Jessie Evans, and Eric Flynn. As Donald, Flynn does an excellent job with a lovely old song that wasn’t in the Broadway production, “I Can Dream, Can’t I?” Another added treat is the ballad “If Only He Knew,” persuasively rendered by Anthony. 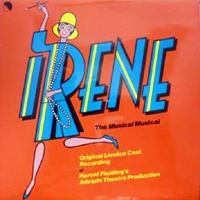 This is an unusual London cast album in that the singers sound like authentic American musical theater performers, and the sound quality of the recording is superb. — G.A.